Designed by an orthopedic surgeon to effectively remove pressure from the heel. Air holes provide optimal ventilation. Two padded Velcro® fastening straps adjust to accommodate different sized patients. The Heelift® Suspension Boots were designed by an orthopedic surgeon to effectively remove pressure from the heel. Choice of convoluted or smooth interior. Elevation pad disperses pressure evenly across entire calf. 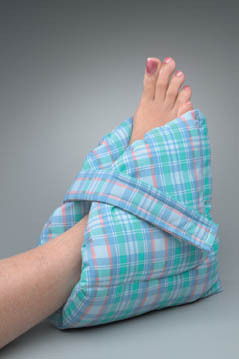 Features smooth tricot fabric covering on the outside for increased patient mobility. Air holes provide optimal ventilation. Secures with two adjustable hook-and-loop straps. Heelift Suspension Boots prevent heel ulcers by eliminating heel pressure by lifting it with an elevation pad and suspending the heel in protective space. Pressure is transferred from the heel to the lower leg. In pressure ulcer prevention regimens, Heelift is appropriate for at risk patients who are immobile, post-operative or suffer from diabetes, cardiovascular disease or dietary deficiencies. 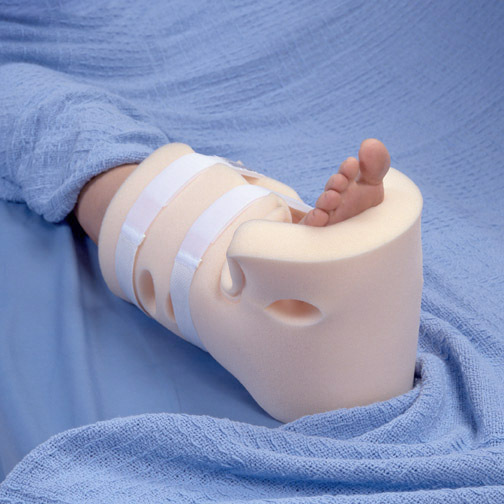 The Heelift suspension boot is an ideal addition to existing treatment regimens and also can be used in cases of foot drop, flaccid paralysis (non-spastic), pre and post-operative hip fractures and skin grafts. 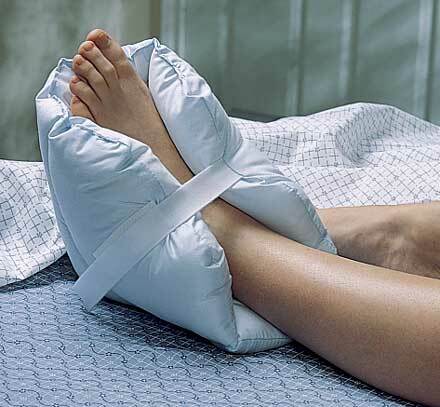 Made from soft, firm, medical grade foam with a convoluted design, Original Heelift effectively removes pressure from the heel, preventing heel ulcers, pressure ulcers and diabetic foot ulcers from forming. Heelift is machine washable if placed in a net laundry bag with the Velcro® straps closed and the extra elevation pads removed. Ventilation holes provide additional air circulation to promote increased patient comfort. Two padded Velcro® fastening straps adjust to accommodate different sized patients, health conditions, and wound dressings. Friction-free tricot backing on the underside increases patient mobility. Polyethylene stiffener prevents boot from buckling. To control hip rotation, the loose elevation pad can be affixed in a horizontal position to the outside of the boot to prevent external rotation. 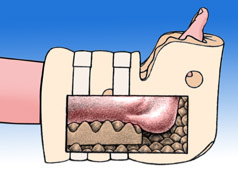 To accommodate patient size, the lower elevation pad which is affixed to the inside of the boot can be trimmed or positioned forward or backward. To prevent foot-drop, the loose pad can be placed under the forefoot. 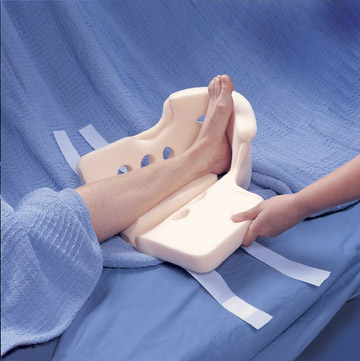 For additional support for heavier patients, the loose pad can be repositioned and affixed on top of the fixed elevation pad. For non-edematous legs or patients who prefer a slightly cooler boot, choose Original Heelift Convoluted Foam. Heelift Suspension Boots are non-returnable if packaging is opened. Buy 2 and save $$$. Standard size measures: 12 inches from heel to calf. 9 inches from heel to toe. Calf Circumference: fits 8 inches - 14 inches. Height Range: fits 60 inches - 77 inches. Weight Range: 120 lbs. - 250 lbs. Wonderful. Has relieved my Dad's heel pain when in bed. Highly recommend.